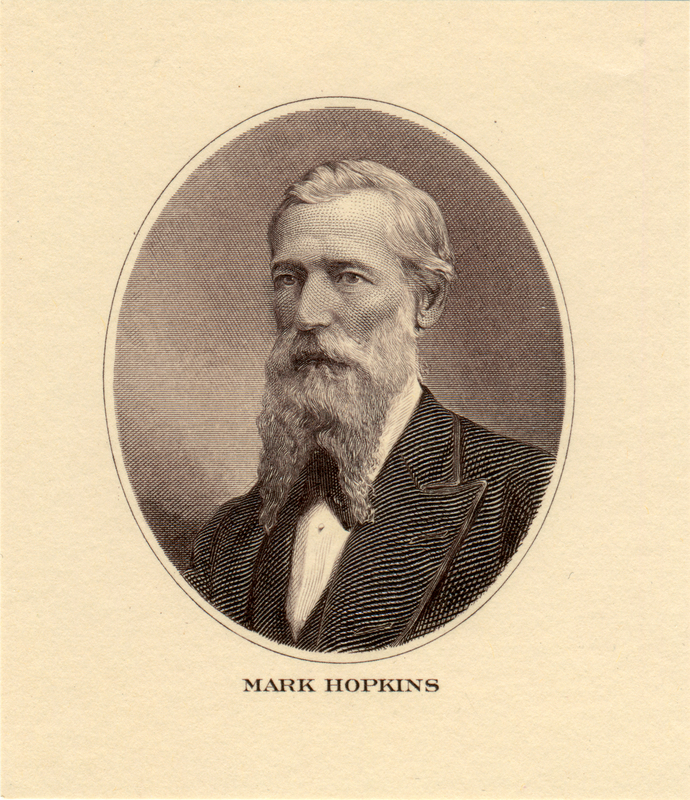 Mark Hopkins, co-founder and treasurer of the Central Pacific Railroad. 1950s intaglio print from earlier American Bank Note Co. plate. Cameo measures 1¾x2¼"; full width is approx. 2.5x3". Heavy stock. The original steel plate would have been used in the manufacture of currency notes or stock certificates produced by ABNCo. Hopkins was the quiet, steady financial genius of the Central Pacific. Born Mark Hopkins Jr. on Sept. 1, 1813, in Henderson, N.Y., he didn't go by "Junior" because his father died when he was young. The gold rush of 1949 brought him to California; in 1850 he opened a wholesale grocery in Sacramento, followed in 1855 by a hardware and iron business with Collis P. Huntington as his partner. Hopkins contributed $1,500 to the formation of the Central Pacific Railroad, which incorporated June 28, 1861. It was chartered by Congress in 1862, which enabled it, among other things, to welch on an earlier deal whereunder Henry Mayo Newhall's San Francisco & San Jose Railroad was to lay some of the track. In 1869 the Central Pacific met up with the Union Pacific at Promontory Summit, Utah, to complete the transcontinental railroad; in 1876 it participated in a similar "golden spike" ceremony when it met up with its own subsidiary, the Southern Pacific, at Lang Station in present-day Canyon Country. Hopkins and Huntington didn't attend the latter ceremony, instead leaving the accolades to the other men who rounded out the "Big Four" of the Central Pacific, Charles Crocker and Leland Stanford. Hopkins died March 29, 1878, while asleep aboard one of his company's trains in Yuma, Ariz. At the time, the mansion that his wife insist he build on San Francisco's Nob Hill was under construction. It was completed, only to be lost in the cataclysm of 1906. Today the 1926 Mark Hopkins Hotel stands in its place. LW2487: 19200 dpi jpeg from original 1950s print purchased 2013 by Leon Worden.